The man who ensured Big Ben accurately struck midnight to within half a second on the eve of the Millennium was due to collect his MBE from the Queen. On New Year's Eve 1999, Brian Tipper was in the clock tower for more than six hours to ensure nothing went wrong. Mr Tipper, of Penge, south-east London, retired recently after 25 years. He was responsible for winding, inspecting and oiling what is officially known as The Great Clock three times a week. Mr Tipper also had to change the time on the nights when the clocks change to mark the start and end of British Summer Time. 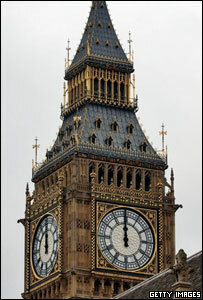 He was often required to work unsociable hours to ensure Big Ben kept perfect time. In 1996, when the rubber buffers on the quarter chimes froze at 2100 GMT, he managed to adjust the hammer ropes to obtain the correct chimes by midnight. And in 2004 a brake shaft broke but his quick-thinking managed to avoid significant damage to the clock.